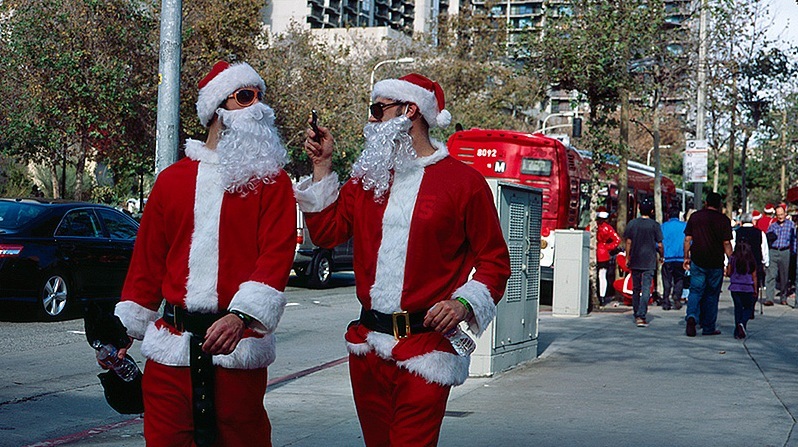 Los Angeles is offering free rides to regular commuters (and Santas) on Christmas Eve and New Year's Eve. Photo by Greg Thomas. Los Angeles Mayor Antonio Villaraigosa announced free rides on the city’s transit system for Christmas Eve and New Year’s Eve, two of the year’s worst nights for drinking and driving. The bickering over payroll tax cuts and unemployment benefits has obscured pre-tax benefits for public transit commuters. Unlike the payroll tax cut, the fate of commuter tax cuts looks bleaker. A bipartisan transportation bill sponsored by Sen. Barbara Boxer could dramatically expand a federal program that finances innovative transportation projects. In order to secure the expansion, Boxer has to introduce new rules, which transportation advocates deem as having stripped away current criteria favoring environmentally sustainable projects. The state of Bihar in India finalized a proposal to develop slums spread over 28 towns in Bihar under the state slum policy 2011. The state government is also developing infrastructure in urban areas like provision of potable water, drainage to prevent water logging and solid waste management. The Chinese government will begin construction on 7 million units of more affordable housing in 2012, while completing 4 million units. The national government in India is pursuing strategic densification along industrial and transportation hubs to make room for future growth. The government plans to develop “ring towns” and connect them to major growing cities with fast transport options. The Mayor of London is expanding trials of an innovative dust suppressant technology that “glues” pollution to the roads in a bid to ensure that the capital meets legal air quality limits. Iran’s Health Ministry issued a warning for people with respiratory and heart ailments, children and the elderly to stay at home due to the extreme levels of air pollution that hit Tehran. The health advisory also recommended surgical masks for taxi drivers and others who must be outside. A United States airlines failed to block an European Union law charging airlines flying to Europe for their carbon pollution. Earlier, the U.S. and other non-European airlines had sued the EU, arguing that they were exempt from the law. Massachusetts commuters spend more time in their cars than most others in the United States. A new study of four ciclovia events in North and South America found that ciclovia events are worth the investment because they reduce health costs and allow people to live longer—and more economically productive—lives. The Kumasi Metropolitan Assembly in Ghana set up a 12-member joint task force to regulate traffic activities and help bring an end to the rising cases of rule-breaking, especially among commercial drivers. The Metro Transit system in Madison, Wis., is no longer exploring the possibility of including audio advertisements on its public buses. In June, the City Transit and Parking Commission heard a presentation from a Dayton, Ohio company that projected it could deliver $456,000 in ad revenue over five years by piping commercial messages through speakers inside buses. A private bus company in Jerusalem is dealing with violence from haredi communities against its buses due to women featured in ads on the buses. Yerushalmim, a political group promoting pluralism and equal rights for women, purchased advertising space on the buses to bring awareness to the topic. Google announced its first ever annual Australian YouTube Viral Ad Zeitgesit, a list of the 10 ads that were biggest on YouTube in 2011. Among the winners was New Zealand Transit Agency anti-drunk driving spot, “Legend.” Watch the ad below.